When I arrived here as Chaplain to the University Campus in Lampeter in May, I had no idea what riches awaited me. The Chapel has a wonderful collection of historic vestments dating from the fifteenth to the nineteenth century. 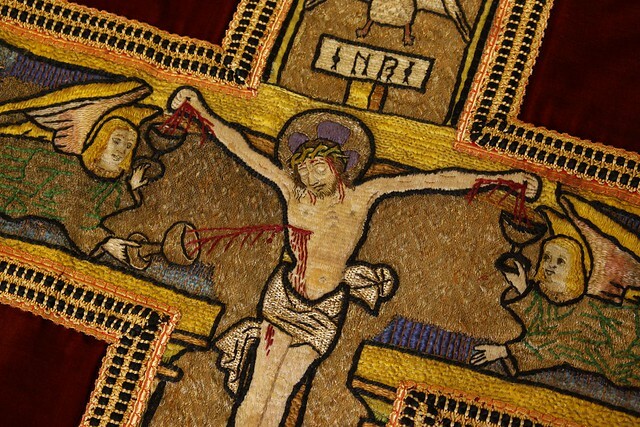 Among the vestments are a modern cope and chasuble, that incorporate embroidered orphreys that have been salvaged from English vestments of the fifteenth and early sixteenth century. 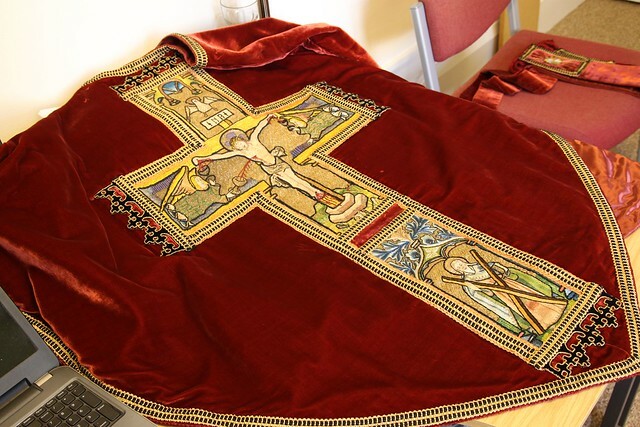 The vestments are currently very bady stored and as part of the process of thinking about their proper storage and display, I had the delight of examining the vestments more closely in the company of the Herefordshire textile conservator Wendy Toulson. It was great to discuss the technical aspects of the work, to get her opinion on the amount of restoration present and for us both to think about the date of the work. Here are our conclusions with respect to the chasuble. The chasuble is modern, made up sometime in the first half of the twentieth century, in a style associated with the Gothic Revilist A. W. N. Pugin. It has a backing of plain murrey coloured silk velvet on which are mounted fifteenth century orphreys, outlined with a thick modern braid. 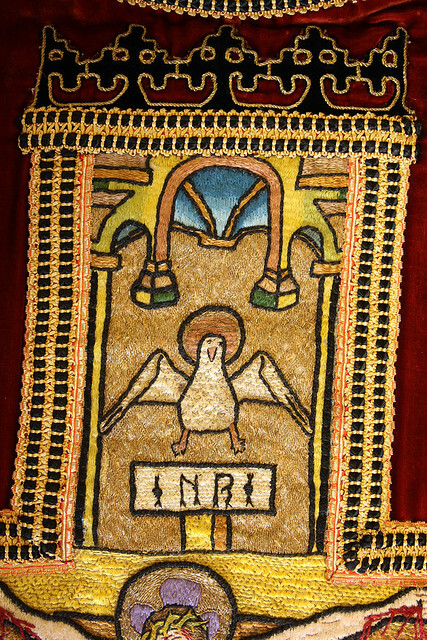 On the back of the chasuble, the orphrey is made up of two distinct panels of different dates. A Crucifixion scene and below it a figure of St Andrew holding his saltire cross. The embroidered panels have either been trimmed or the thick braid overlays now mask part of the embroidered work. Wendy discussed how we might at some point lift the braid in places to see what's underneath. The Crucifixion panel is a standard late medieval form, and iconographically it alludes to the prevaling Eucharistic theology of the time. Christ crucified is flanked by angels collecting his the blood from his wounds into chalices. At the foot of the cross is the skull and crossbones of Adam (sadly interrupted by the braid) and above the cross is the Holy Spirit set under a little vaulted canopy with pendants. Stylistically the panel almost certainly dates from the very close of the fifteenth century or the early years of the sixteenth century, that is indicated by the hairstyle of the angels and the general details of the architectural setting. 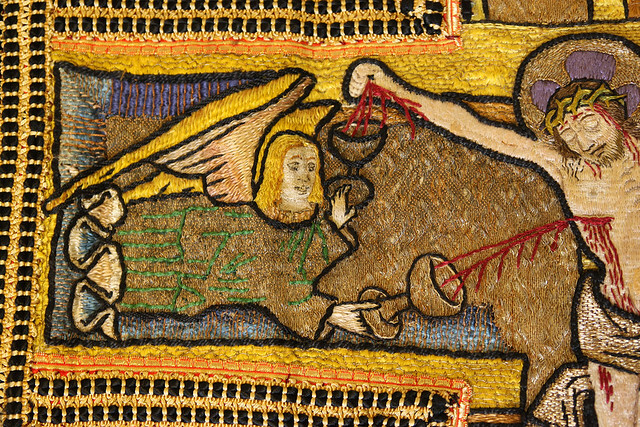 There has been some overworking on this panel, the blood has been replaced and rather rough embroidery has been added to the robes of the angels to indicate folds and shading. Other areas appear to be little touched, notably the figure of Christ himself, the Holy Spirit and the diapered goldwork ground. 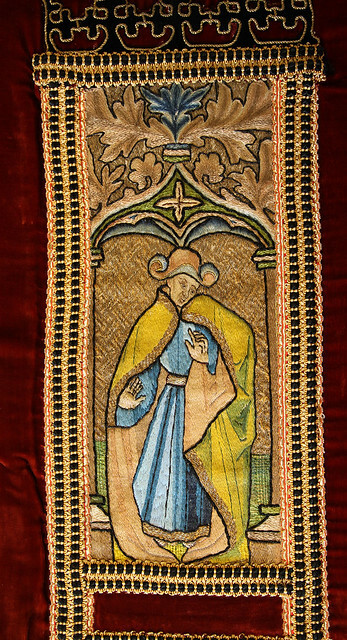 A lot work of this sort was mass produced in London workshops from standard cartoons and there are two chasubles I have traced so far, that have orphreys that are near-identical to this and were the product of the same workshop as the Lampeter orphrey. One is in the V&A collection (link to photo) and is dated to 1500-1525. The other is in the Keir collection and is now in the Dallas Museum of Art, where it is dated to the late fifteenth or early sixteenth century. (note 1) In both cases the orphrey is untrimmed, giving a sense of the original form of the Lampeter orphrey and indicating that that under the modern braid is probably a larger architectural surround that is presently only hinted at. The orphreys on the V&A and Keir chasubles are both mounted against a ground of blue velvet, that is powdered with waterflowers, fleur-de-lys and Seraphim. And they give a sense of the original visual context to the Lampeter panel. 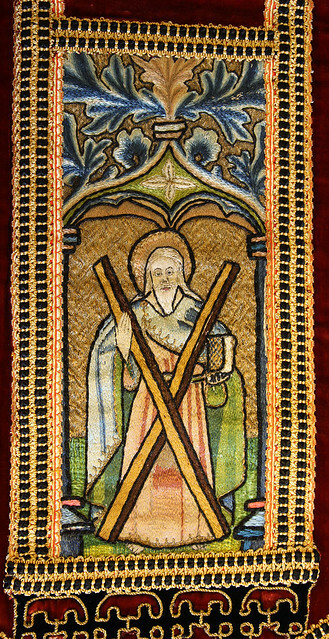 Below the Crucifixion orphrey is a smaller panel, a figure of St Andrew holding his saltire cross. If you turn the chasuble over and look at the back there are two further panels. At the top a figure of an Old Testament Prophet, you can tell he's a prophet from his lack of nimbus, his Jew's hat and his hand gestures: he's prophesying! Below is a figure of an unidentified saint with an extraordinarily long beard, holding a book and what appears to be a stick. We wondered if the stick was a later alteration and that the figure was originally holding a sword and was therefore St Paul. Now these three panels appear to be part of a set. They figures are all placed within identical or near-identical architectural surrounds, again somewhat curtailed by the modern braid. The figures sit under vaulted canopies supported on pillars to left and right. The canopies have an ogee shaped top, with elaborate foliage crockets and with a little quatrefoil in the centre. The ogee terminates in a finial that sprouts fourth with abundant blue and brown foliage. As Wendy pointed out those brown tones were originally a much more vibrant red, the silk having been dyed with Madder, which was not colour fast and fades down to brown. Under the figure of the unidentified saint is the top of another canopy, so these figures were from a much bigger set of figurework. There had been some overworking of all three of these panels, but the figures on the back of the chasuble have been less tampered with than the figure of St Andrew, where large portions had been overworked. Stylistically we concluded that these three panels were earlier than the Crucifixion orphrey and probably dated from early in the third quarter of the fifteenth century, between 1450 and 1460. 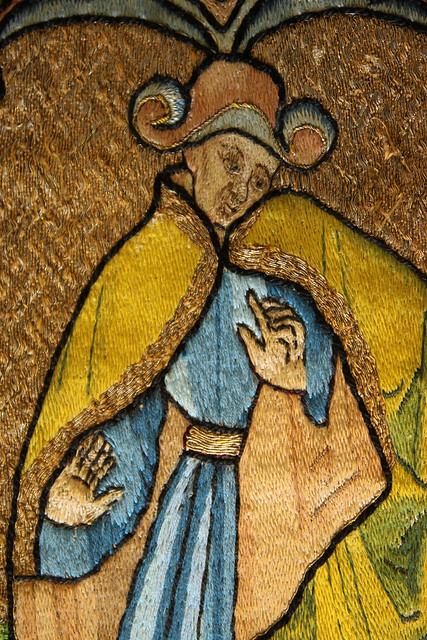 The prophet, for example, is dressed in contemporary mid fifteenth century dress with fur trimmed gown. The canopy, with its very particular form of voluptious foliage is of a type that seems to originate in the late fourteenth century (it's late Decorated in feel), but persists right through to the middle of the fifteenth century. The closest parallel I have found is illustrated in Maclagan's Catalogue of Embroidery in the V&A, over a figure of St Lawrence. He dates that orphrey to the first half of the fifteenth century. (note 2). So the chasuble is a wonderful example of recycling, a modern vestment but using panels embroidered in England between 1450 and 1520. I have to be careful wearing it! Note 1. M. King and D. King, European Textiles in the Keir Collection 400BC to 1800AD (London, 1990), pp. 103-104.